I forgot to show you guys this dress and just came across it in my drafts. I have it a while now & absolutely love it because of the colour and print. Plus, it's floaty shape makes it so easy to wear. 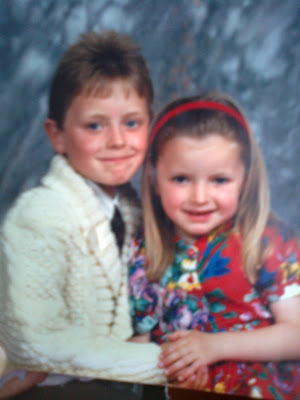 Funnily enough, it reminds me of a dress I loved as a child as seen here in this picture of me and my big brother. I guess reinforces makes the argument that trends really do come around again....not that I mind. Is there any trends you would be happy to see come back?